Bohemian Rhapsody – The Review. I am struggling to find a way to start this post. Does that happen to you guys? Do you get lost in a sea of “Hey Guys”, “Morning” and “Welcome back” – well that is me this morning. So I am going to just jump into this post. Because last night I went to the cinema to watch Bohemian Rhapsody and I was blown away. For the longest time I have been a Queen fan, their music, talent and story has always been a part of my life. Top three favourite bands of all time and annoyingly it took me a good week and a bit to go see the movie when it came out. But I made a point to go this weekend, we’ve been very busy as you might know with house stuff but it was time to take a break. So me and the GF went out for dinner, then popped over to the Cinema for some overpriced ice cream and a cute impromptu date night. With Bohemian Rhapsody on the cards we were set to go. Let’s begin. Get on your bikes and ride! Two years ago Channel Five did a docudrama about Freddie, his life, his troubles and his death – The Freddie Mercury Story: Who Wants To Live Forever. If you ever get a chance to watch this please do. It’s amazing. In my eyes this film and that Docudrama compliment each other so well they are almost like a double feature. Then when they announced they were making this movie I was hyped and psyched. I loved this movie, the entire thing was amazing, breathtaking and emotional. Following the life of Freddie Mercury a young Parsis man in 70’s London being discriminated for his heritage, his style and his teeth. We see Freddie meet May, Taylor and Deacon, form the a group called “Queen”, take some big gambles, record some unique styles and sounds, then just watching their music and career go from strength to strength. But at the same time watching his lavish and promiscuous social life take its toll on his friends and real relationships as it spirals out of control into a drug binge. 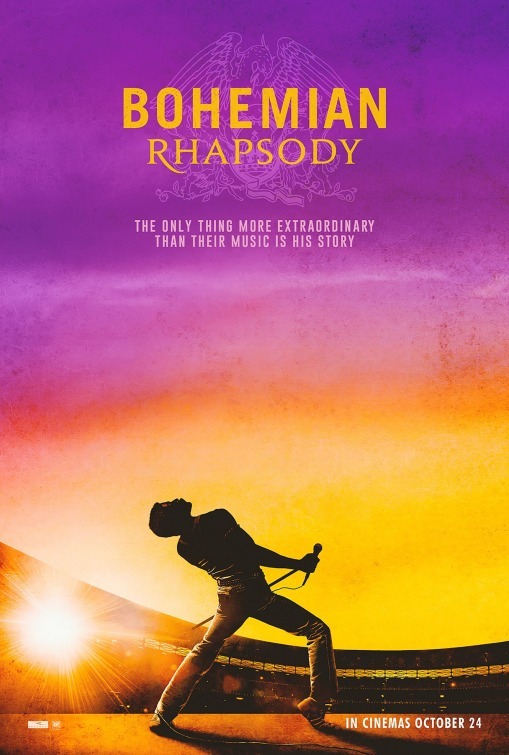 The film hits all the emotional notes you’d expect, you take the journey with the band, feeling the highs and tingle of them writing; Another one Bites the Dust or Bohemian Rhapsody, to the lows and troubles of Freddie being played, relationships breaking down and then watching him realise and get diagnosed with AIDS. The last 40 minutes of the film I had a frog in my throat, it chokes you up big time. But that is his story, the magic behind the Great Pretender. And what a story it is – another thing that really helped this film was the incredible casting, because for me the entire cast were spot on. Malek obviously goes without saying absolutely nailed his performance as Freddie. But saying that the whole band were amazing; Lee, Hardy and Mazzello playing May, Taylor and Deacon bounced off each other perfectly and it’s exactly what I would imagine the real band would have been like. Even having Mike Myers as Ray Foster the EMI exec who tries to tell the band that Bohemian Rhapsody is too long and not what the people want, claiming that no one will ever rock out and head bang in their car to that song . . . . (Yes they made that joke and I seemed to be the only person in the cinema that laughed) was amazing casting. Overall the film was amazing, I am still in awe of it. This morning I woke up thinking about it on so many levels and I can not recommend it enough as it’s a story you need to know and see. I can see it making an impact next February when Award Season starts. You have heard it here first!